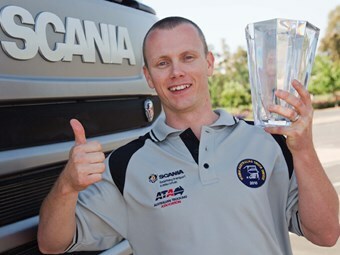 WA Freight Group driver Rick Lockwood was judged best on the day at the Scania Young Australian Truck Driver competition at Melbourne’s Flemington Racecourse on Saturday. Along with other contestants, Lockwood had to prove his mettle by completing a course in a Scania prime mover. He won $10,000 in prize money, a $4000 travel voucher and an Orrefors crystal vase for his effort, but he admits his circuit was not without incident. "I actually didn’t think I went as well as I did," Lockwood says. "I fell off the plank. I think that’s on the video. I wasn’t very happy about that." The stars have aligned for Lockwood this year, having married sweetheart Amy eight months previously. The trip to Melbourne came as a semi-honeymoon, as Lockwood had to do his regular trip from Perth to the Pilbara straight after the wedding. Lockwood has described the prize as "something very, very special". "It’s quite amazing to receive some recognition in an industry that often doesn’t give recognition, especially guys who’ve been doing it 50, 60 years, who haven’t seen recognition from anyone. "It’s a big step forward." Recognition and redressing the lack of it for truck drivers was a theme pursued by Scania Australia CEO Roger McCarthy in his welcome speech. Lockwood hopes to parlay his achievement into helping raise the industry profile in schools among 16 and 17-year-olds and to educate them on how best to behave as motorists around trucks. Similarly, when asked what might make a difference to the public’s perception of the industry, Lockwood says: "I think a big part of it is engaging the public." He adds: "You talk to one person and they go away with a positive image, they talk to 10 of their friends who talk to 10 of their friends and so on and so forth." Longer term, he hopes to put his business plan into action and eventually own his own business but short-term: "Tuesday night, I get back in the truck and head out to Port Hedland." Asked if there were other tests Scania and competition partner the Australian Trucking Association might include in future competitions, he suggested more practical tasks, such as hooking and unhooking of trailers and couplings and fixing broken parts such as airbags or tyres. Lockwood started driving in 2000, carrying racehorses from Sydney to Port Macquarie for his father. But he credits his time working for Jim Pearson Transport and the mentoring of Paul Jones and Jim Pearson for helping him get to his present level of skill. He has been nine months back on linehaul, having been a linehaul supervisor. Lockwood says the prize money is likely to go on paying bills, while the voucher is destined to take the couple to Ireland, where Amy’s family came from from. SK Enterprises driver Nick Hornby of the Northern Territory won a $3500 travel voucher for his second-place effort, while Melbourne Fire Brigade driving instructor Jarrad Jeffs came third. Asked by the organisers what the greatest challenge facing trucking is, contestant responses included recruitment, its public profile, and road behaviour of truck drivers and other motorists.